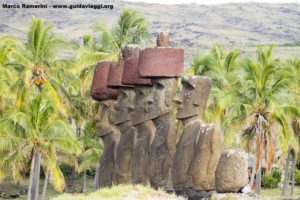 Easter Island is famous for its mysterious civilization, the one that built the huge volcanic stone statues called “moais”. 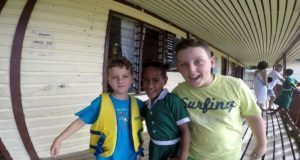 The island is located in the so-called southern seas, in the waters of the South Pacific Ocean and is part of the Polynesian islands. 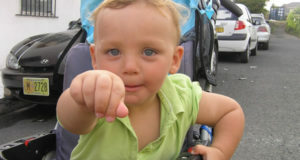 Even its original inhabitants are Polynesian and speak a language similar to the Tahitian. 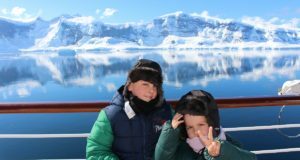 The island, however, has an aspect that does not remember absolutely the spectacular Polynesian islands full of tropical vegetation, shining lagoons and postcard sea. 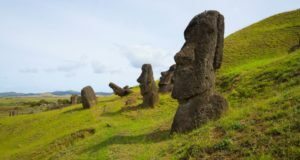 The Easter Island has in fact a barren landscape and poor vegetation. 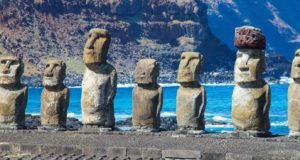 Its coasts are rocky and wild, formed by a succession of black volcanic rock where the powerful waves of the Pacific Ocean break. Often, the waves beat on cliffs that reach even hundreds of meters in height as happens at the two volcanoes Rano Kau and Poike. 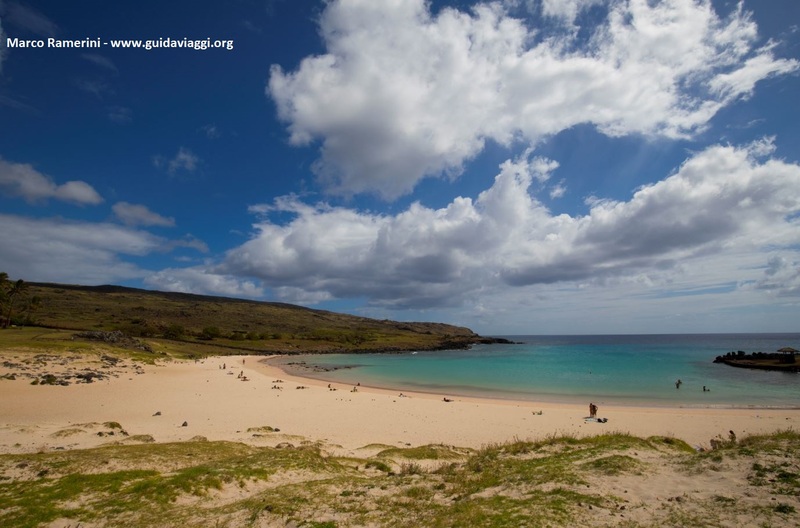 Along the coasts of the island there is however an exception: the beach of Anakena. 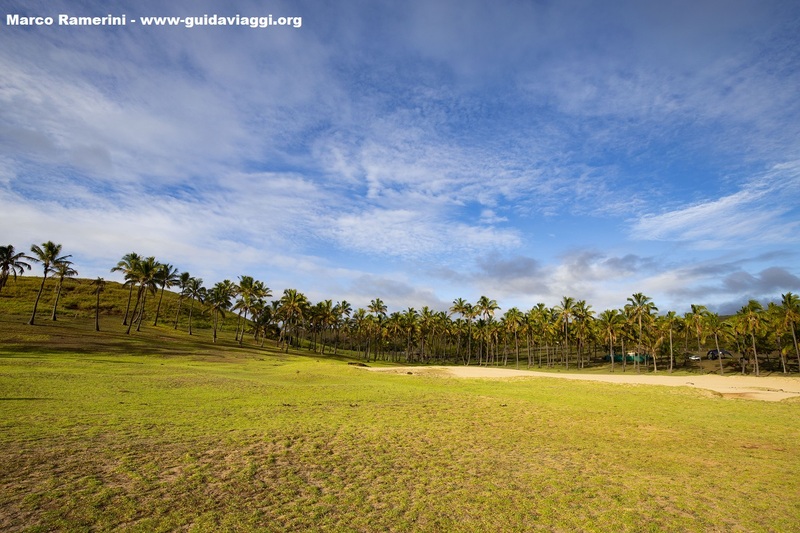 Located almost halfway along the northern coast less than 20 km away from the only inhabited center of the island, Hanga Roa, the beach of Anakena is the closest it gets to the beach canons of the southern seas. 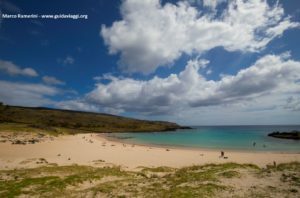 The bay of Anakena is a beautiful crescent-shaped inlet formed by soft white coral sand and bathed by a sea with beautiful blue colors. 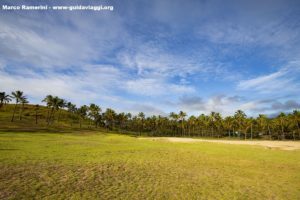 The beach is surrounded by a coconut palm plantation, the only one on the island. 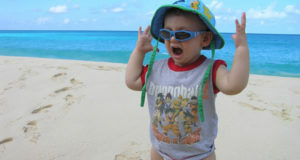 This is a great place to relax for a few hours and take a bath in the warm and calm waters of the Pacific Ocean. Next to the car park located at the end of the road (not the first you meet, but the next one) there are some small restaurants where you can taste excellent empanadas and delicious fruit juices. 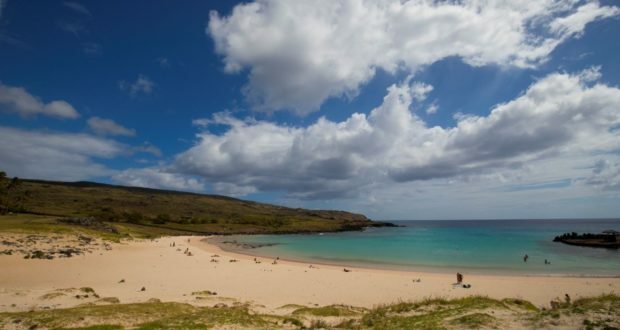 According to the oral tradition of the Rapa Nui people, the beach of Anakena is the place where the first inhabitants of the island landed: here in fact arrived the Polynesian expedition led by Hotu Matu’a, the first king of Rapa Nui. It seems that this happened between 700 and 1100 AD. 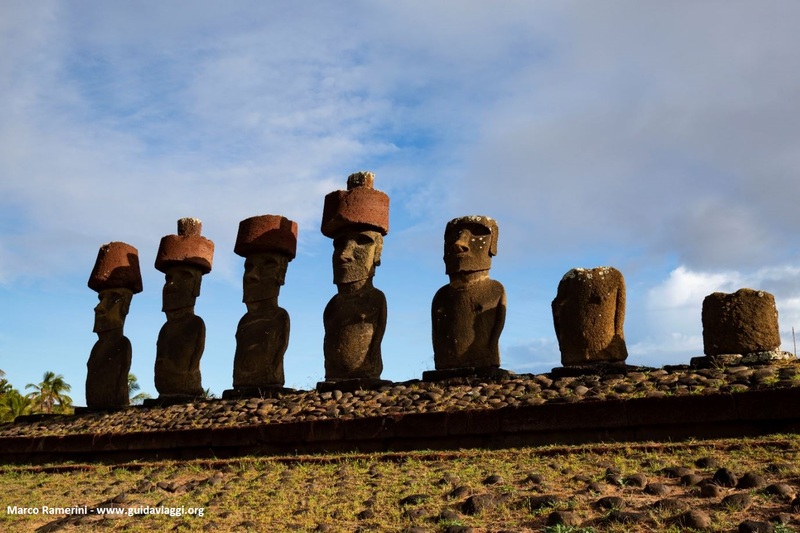 Behind the beach, in a very scenic position are the seven statues of the Ahu Nau-Nau. 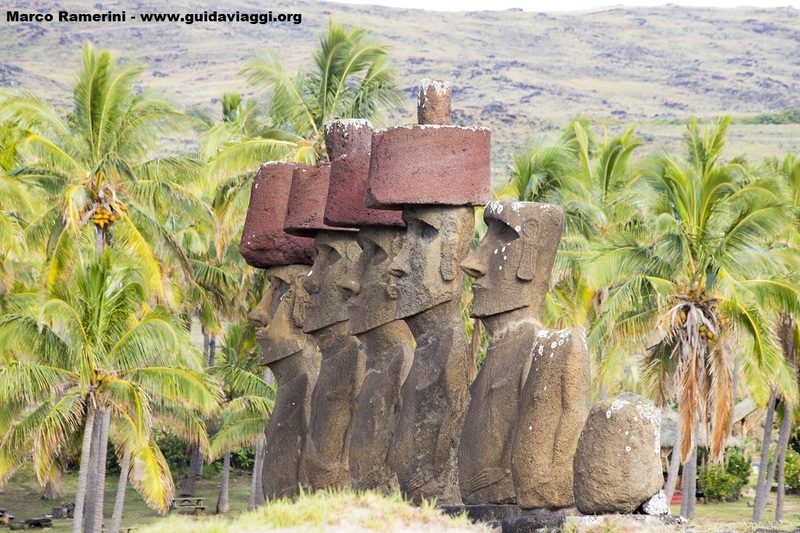 Four statues are surmounted by the characteristic red rock hat coming from the Puna Pau quarry, a statue is deprived of it, while the other two are also missing from the head. 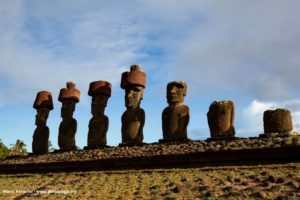 Another platform for moais is closer to the sea, here is a unique moai: the ancient statue of Ahu Ature Huke. 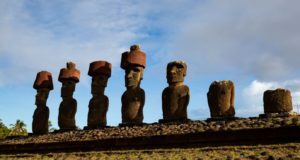 This moai was the first of the island to be restored and relocated to its original location by the Norwegian explorer Thor Heyerdahl in 1956.